1849 Pacific Company $1. K-Unlisted. Rarity-8. MS-61 (NGC).A highly significant offering and fleeting bidding opportunity for the advanced collector specializing in private and territorial gold coinage. This is an endearing specimen, both sides with delicate pale rose and powder blue highlights to dominant light golden patina. The strike is exceptional for a privately issued gold coin, all design elements boldly to sharply defined. Wispy hairlines and a slightly subdued finish explain the MS-61 grade from NGC, but the in hand appearance is quite smooth and the eye appeal is far superior to that of the only other example of this type currently traced.<p>Only three examples of this legendary rarity are known to exist, one of which was stolen in 1967 and has since been lost to the numismatic community.<p>1 - <strong>NGC MS-61</strong>. Ex Ben Greens sale of August 1910; Virgil M. Brand, acquired August 1910 via private sale, Brand Journal number 54157; J.C. Morgenthau & Co.s sale of October 1933, lot 275, returned to Brand heirs; Brand estate - Armin Brand - Jane Brand Allen; our (Bowers and Merenas) sale of the Virgil M. Brand Collection, Part II, June 1984, lot 1545; our (Bowers and Merenas) sale of the Jay Roe Collection, July 2002, lot 943; Stuart Levine; Heritages sale of the Riverboat Collection, April 2014, lot 5432. <em><strong>The present example</strong></em>.<p>2 - <strong>NCS AU Details--Mount Removed</strong>. Ex our (Bowers and Merenas) sale of the Paul S. Mory, Sr. Collection, June 2000, lot 1041; our (American Numismatic Rarities) Old West and Franklinton Collections sale, August 2006, lot 1128. This coin was discovered by metal detectorist, Jerold Reinford, in New Bethlehem, Pennsylvania, June 1999.<p>3 - <strong>Holed</strong>. Ex H.O. Granberg (1914 ANS Exhibition); Waldo C. Newcomer; B. Max Mehl, ca. 1931; Charles Williams (Numismatic Galleries 1951 FPL); possibly to Lammot duPont; Willis duPont; stolen in 1967 and since untraced.<p>As the California Gold Rush heated up, many enterprising companies struck out for the gold fields with the hopes of assaying the finds and producing locally accepted privately issued coins. While there are recorded a number of such proposed companies with "Pacific" in their names, it is widely accepted that the Pacific Company formed in Boston on January 8, 1849 by John W. Cartwright is the organization originally behind the Pacific Company coinage. Composed of 38 subscribers who contributed $1,000 each to join, the Pacific Company bought and outfitted the vessel York. As part of their equipment were sets of dies for a planned issue of $1, $2.50, $5, and $10 gold pieces. 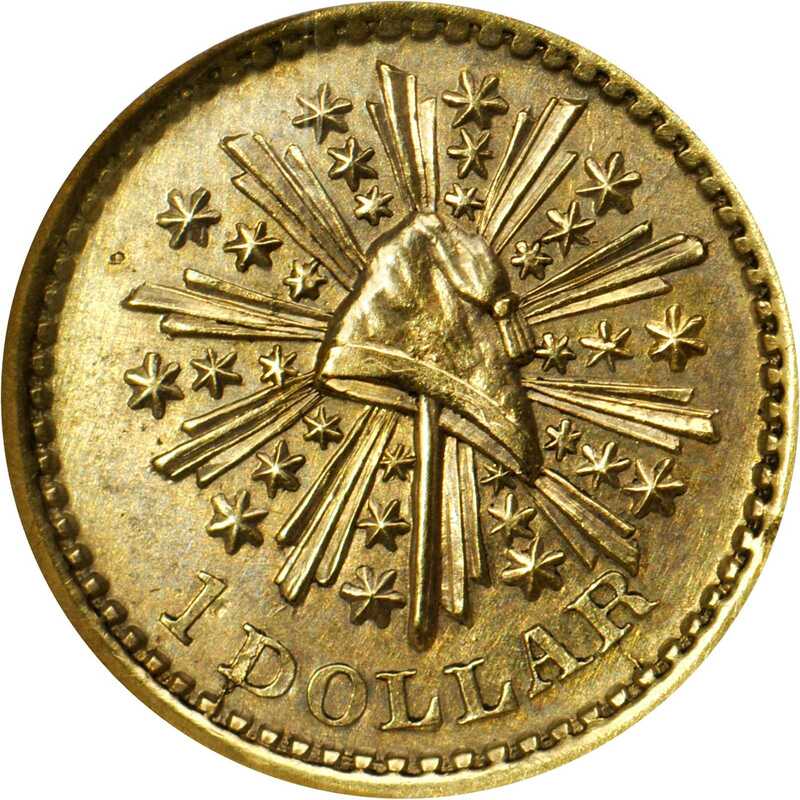 The four denominations all bear a version of the same design: on the obverse is a Liberty cap with stars and rays (closely resembling Mexican silver coins of the period) with the denomination indicated below and on the reverse is a heraldic eagle clutching an olive branch and hammer surrounded by the legend, PACIFIC COMPANY, CALIFORNIA. and the date 1849. The York sailed out of Boston Harbor on April 1, 1849 and arrived in San Francisco Bay on September 16. One of the company members presciently observed in his diary: "All that board us say that our company will break up as all others have done." That is indeed what happened not long after the party arrived at their destination of Benicia on October 8. Scarcely twelve days later the Pacific Company was officially dissolved and its members went their separate ways without having ever striking a single gold coin.<p>Based on a thorough analysis of surviving Pacific Company coins, the dies apparently came into the possession of the well-established assay company of Broderick & Kohler in San Francisco soon after the original companys dissolution. Col. Jonathan D. Stevenson, a former commander of a regiment of New York Volunteers and a veteran of the Mexican War found early success in the Gold Rush. He brought in fellow New Yorkers Frederick D. Kohler and David C. Broderick to begin an assay and refining firm that soon branched out into coining using the Pacific Company dies. Broderick & Kohler opted to use the dies with no modification to produce their own coinage, primarily consisting of $5 and $10 pieces. Unlike most private coiners, Broderick & Kohler did not use a screw press but instead produced their coins using a sledgehammer. When the coins were first introduced into daily commerce, the coins were accepted at par initially under the premise that anything was better than using raw gold dust and placer gold. Like many other of the earliest private coiners during the Gold Rush, the coins purity was inconsistent at best, mostly based on the fineness of the metal as originally mined without much further refinement. While some coiners tried to compensate for this by making their coins heavier, the Pacific Company coins were not, earning the business a decent return on investment while short-changing the public who used the coins. This business model fared well for both Broderick and Kohler because of the high profit margin and, combined with successful real estate investments, they soon were able to shutter their assay and coining business. Broderick was elected as state senator in January of 1850 and left the partnership, while Kohler carried on for only a couple of months before shuttering the business and selling off all the firms equipment in its entirety in March to Baldwin & Co., long before the comparatively low purity of their product was discovered. 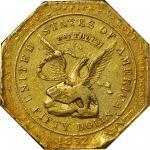 When examples of the $5 and $10 coins were assayed by the Mint in 1851, they were found to have an intrinsic value of $4.48 and an astonishingly low $7.76, respectively, among the lowest of the private issuers at the time. Once news of the poor assays reached California, the coins were promptly rejected as sub-par and quickly found themselves in melting pots within just a few years, accounting for the tremendous rarity of any Pacific Company issue today. Despite the assay results, Kohler and Brodericks reputations appear to have not been substantially impacted. Kohler became State Assayer the following month and continued on in local public service until his death in 1864. Broderick was eventually elected U.S. Senator for California in 1857, an office he held until he was killed in a duel in 1859.<p>While dies were produced for a $2.50 coin, no gold example has to date ever been found or recorded, just a precious few silver patterns. 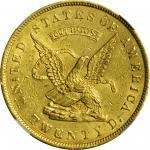 For decades, the gold dollar was also widely assumed to have been struck in gold for circulation. 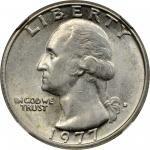 At least three silver pattern strikes are known, including a uniface obverse struck on a 1776 Spanish colonial 1 real coin and another overstruck on a half dime, as well as additional extremely rare specimens struck in white metal. Precisely who struck the off-metal patterns is not known; they could have been produced back East when the dies were prepared or by Broderick & Kohler to test their coining equipment. Wayte Raymond illustrated a holed example of the gold dollar (almost certainly the Granberg-Newcomer-Mehl-Williams-duPont specimen) in his 1931 work, <em>Private Gold Coins Struck in the United States, 1830-1861</em>, though with no commentary. Even in 1981s landmark <em>Private Gold Coins and Patterns of the United States</em> by Donald Kagin the $1 issue was listed as a pattern.<p>The $1 piece continued to be considered a pattern for many years until June of 1999 when a metal detector in New Bethlehem, Pennsylvania recovered a gold specimen. 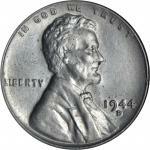 This coin was at one time mounted onto jewelry and retains the evidence of the solder used to mount the coin. 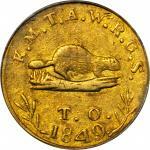 As news of the confirmation that gold $1 coins exist, the issue once again attracted interest. The Granberg-Newcomer-Mehl-Williams-duPont piece illustrated by Raymond back in 1931 was also reassessed and though the coin itself cannot be examined, it is regarded to be a gold coin. Since the turn of the twentieth century, this specimen was originally thought to be a gilt silver pattern and was listed as such until 2002 when it was suspected to actually be struck in a somewhat lower grade gold alloy. The coin was then certified by NGC and confirmed to be gold, only the second confirmed Pacific Company $1 piece so identified.<p>The two currently available specimens were given metallurgic tests and were found to have wildly differing purity levels. The discovery piece was found to be comprised of 64.5 % gold, 16.1% silver, 8.9% copper, 5.3% silicon, 4.0% aluminum, and 1.1% iron while this piece is 72.2% gold, 16.8% silver, and 11.0% copper. This is consistent with naturally occurring unrefined California gold found at differing locales. Such varying purity was later accepted as normal with the Period I fractional gold coins that started to be produced by local jewelers around 1853, though by then these served more as a token currency unlike what was expected to be a dollars worth of precious metal just a few years earlier.<p>The three gold pieces known only survived due to pure circumstance; the New Bethlehem coin was no doubt only preserved for posterity because it was considered a souvenir at the time and incorporated into jewelry rather than be sold as scrap gold and end up in a crucible. 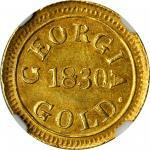 Today only three $1 gold coins are known, of which only two are traceable. This is the only undamaged example of the issue and by far the finest extant. Here is presented a singular opportunity to add a superlative example of one of the great rarities of California Gold Rush numismatics.Ex Ben Greens sale of August 1910; Virgil M. Brand, acquired August 1910 via private sale, Brand Journal number 54157; J.C. Morgenthau & Co.s sale of October 1933, lot 275, returned to Brand heirs; Brand estate - Armin Brand - Jane Brand Allen; our (Bowers and Merenas) sale of the Virgil M. Brand Collection, Part II, June 1984, lot 1545; our (Bowers and Merenas) sale of the Jay Roe Collection, July 2002, lot 943; Stuart Levine; Heritages sale of the Riverboat Collection, April 2014, lot 5432.